Although overshadowed by its more pricey, and glamorous sibling, the Zeiss 24-70mm f4 OSS, this also stabilized 28-70mm f3.5-5.6 OSS model looks like an attractive option. It’s not quite so wide of course and it’s 1 stop slower at the longer end but it’s 1/3 stop faster at the wide end and it its just $499, instead of $1,199 for the Zeiss. It has a total of 9 elements in 8 groups with one low-dispersion element and three with aspherical surfaces to reduce chromatic aberration and distortion. Also, it has dust and moisture sealing and a seven-bladed circular diaphragm for improved rendition of specular highlights and smoother transitions to out-of-focus areas. It weighs 10.41 oz (295 g) adopts a 55mm filter thread, and measures 2.85 x 3.27″ (72.5 x 83mm) and is available now. 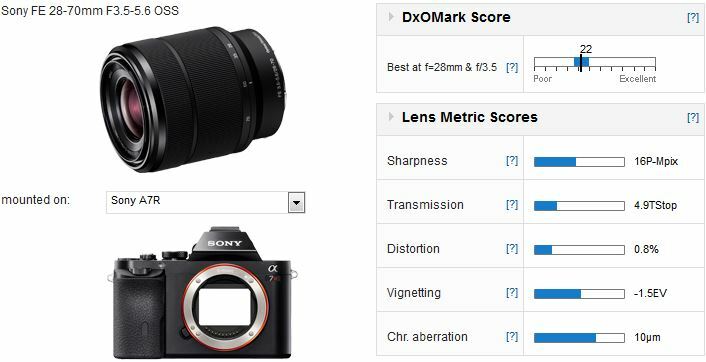 The Sony achieves a respectable DxOMark score of 22 points, which is around the expected figure for a lens like this. Sharpness levels are a little on the low side with a maximum 16P-Mpix rating somewhat disappointing on a camera with the potential to achieve 36P-Mpix, however zooms rarely, if ever, match primes for sharpness. The modest aperture and use of ED glass has kept CA to reasonably low levels while distortion and vignetting are both low and easy to live with. 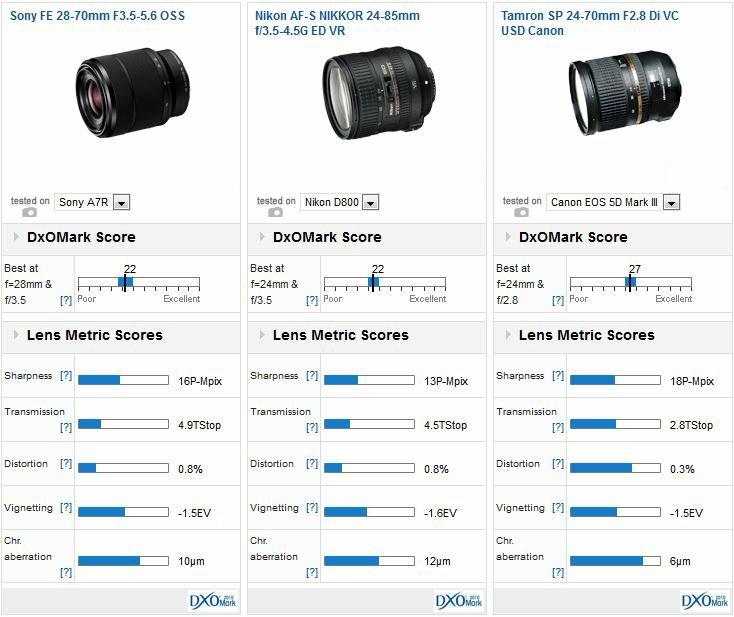 So how does it stack up against the Zeiss? With 3 points in the lead the Zeiss is a better performer on the whole, but, given the price, it’s not by a big a margin as you might expect. 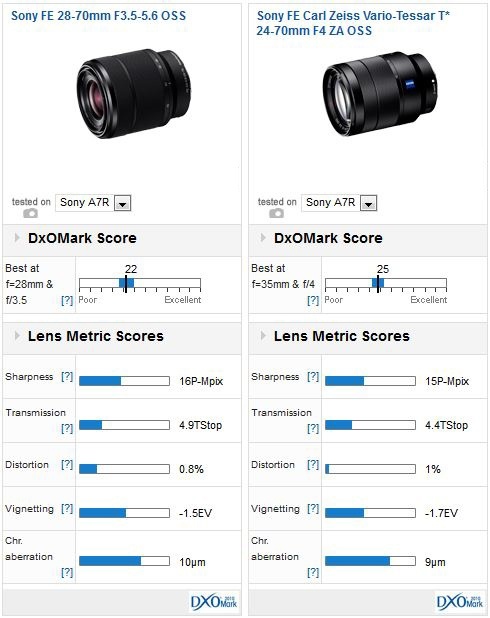 The Sony even has a slightly higher-peak sharpness score but the difference in this figure is practically negligible. The difference in maximum aperture between the two is somewhat confusing for novices. The Sony has around +2/3 stop advantage in Transmission at the wider-end on the Sony A7R however at 50mm it’s -2/3 stop slower, falling to around -2 stops at 70mm. Also, the constant aperture of the Zeiss means it’s more suitable for advanced video users. On the other hand, the Sony has lower vignetting, distortion and similar levels of chromatic aberration, making it good value against the Zeiss. We won’t go into detail with other marques and systems in this instance, but as a guide the Sony performs at a similar level to the Nikkor 24-85mm f3.5-4.5G ED VR on the Nikon D800 (note we expect higher sharpness with the D800E), yet it’s behind the Tamron SP24-70mm f2.8 on a Canon EOS 5D Mark III in overall IQ and in peak sharpness. We’ve now compared the five models currently available for the Sony A7 and A7R, please follow the links to the respective reviews. 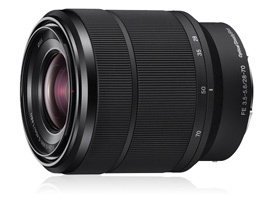 Although enthusiasts will head straight for the Zeiss, anyone on a budget won’t feel short-changed from the Sony 28-70mm f3.5-4.5. It has some shortcomings, particularly with regard to uniformity at the wider apertures where it’s easily outclassed by the Zeiss but the Sony puts up a good fight overall and doesn’t cost the earth.